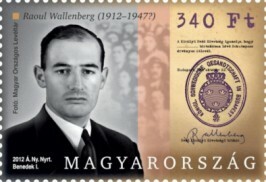 Raoul Wallenberg´s stamp by Hungarian Post. The Hungarian Post (Magyar Posta) issued a stamp to commemorate the centenary of the birth of Raoul Wallenberg. The stamp was presented on 10 May by Gabriella Nikodém, the director of the Stamp Museum (1074. Budapest, Hársfa utca 47.) Ambassador Karin Olofsdotter, Mr László Geszti, CEO of Magyar Posta and deputy State Secretary Gergely Pröhle delivered speeches at the event. The 340 HUF stamp was designed by the graphic artist Imre Benedek. In the brackets (1912-1947?) above the portrait a question mark indicates the fact that the date of Wallenberg’s death is still considered to be unknown. The picture on the envelope issued alongside with the stamp depicts the monument in Szilágyi Erzsébet fasor and contains the following quotation from Wallenberg in Hungarian and Swedish languages: “To me there’s no other choice”. At the same time, the representative stamp exhibition titled “Rescuers” opened in the Stamp Museum. On the same day, The Swedish Post released a Wallenberg stamp block for 12 SEK. Magyar Posta offers the Hungarian and Swedish stamps on a joint first day cover. Earlier Magyar Posta released a different Wallenberg stamp on the eightieth anniversary of his birth, in 1992.